Graphs, in this case pie charts, should be able to stand alone and give all the information needed to identify the main point quickly and easily. The media gives the impression that making and interpreting graphs is no big deal. However, in statistics, you work with more complicated data, consequently taking your graphs up a notch. 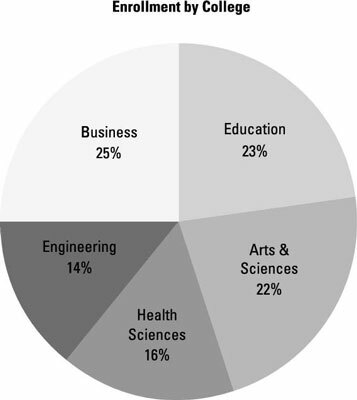 The following pie chart shows the proportion of students enrolled in different colleges within a university. Which college has the largest enrollment? The Business College has 25% of the student enrollment, which is the largest proportion of any college. If some students were enrolled in more than one college, what type of graph would be appropriate to show the percentage in each college? To get the information across correctly, you want to show the results from each college separately by using separate pie charts or one bar graph (note that the heights of all the bars in a bar graph don’t need to sum to 100%). What percentage of students is enrolled in either the College of Education or the College of Health Sciences? To find the percentage of students enrolled in these two colleges, simply add the percentages together: 23% + 16% = 39%. What percentage of students is not enrolled in the College of Engineering? To find the percentage of students not enrolled in the College of Engineering, subtract the percentage of students in the College of Engineering from the whole: 100% – 14% = 86%. How many students are enrolled in the College of Health Sciences? This pie chart contains information only about percentages, not the total number of students nor the number in each category. If 25,000 students are enrolled in the university, how many students are in the College of Arts & Sciences? To find how many students are enrolled in the College of Arts & Sciences, you multiply the total number of students by the percentage enrolled in that college, which is 22%: (25,000)(0.22) = 5,500.